Richard Martin was an ardent advocate of Catholic Emancipation for c. 40 years before it was eventually granted – and would have been a close associate of Daniel O’Connell. Always ‘Catholic’ and always known as ‘good’ Irish landlords the Martins of Ross reputation for generosity and kindness after the famine has been well acknowledged. Having set up their own soup kitchens and taken in ‘scores’ of destitute people a number of family members also went to London to work – sending their earned money home to help feed their starving tenants. Note: I understand Richard Martin’s life is currently the subject of a planned 50-minute documentary by a Welsh/Galway based Film Company ‘Seanchaifilms’. However, when I met George he knew nothing about another member of this illustrious Martin family, ‘Violet Martin’ – subsequently given the pet name ‘Martin Ross’. One of 10 children and born in 1862, Violet, a real ‘lively’ girl, showed significant literary ability – even before she left national school. Keeping a diary from age 12 and spending a lot of time in the kitchen with the various staff (customary for big houses at that time) Violet was also learning ‘their country accents’ and ‘their sayings’ – a feature she subsequently utilise often in her writings. Educated in a Dublin private school she was already fluent in a number of European languages by age 22 having spent time in London, Paris, Geneva and Rome. However, it was at a wedding in west Cork the mid 1880’s that Violet’s life changed – when she met a 2nd cousin Edith OE Somerville from Castle Townshend, West Cork. A couple of years younger these two ‘cousins’ became ‘inseparable friends and went on to become the famous ‘Somerville & Ross’ pairing of some 40 books…including the famous ‘Irish RM’ series. A feature of this relationship is the fact that following Ross’s death in 1915 (complications following a fall from a horse some years earlier) Somerville continued writing under their original ‘brand’ – claiming Ross was in continuing communications and guiding her…via regular séances. Somerville & Ross Gravestones Edith Anna Œnone Somerville (2 May 1858 – 8 October 1949) was an Irish novelist who habitually signed herself as “E. Œ. Somerville”. She wrote in collaboration with her cousin “Martin Ross” (Violet Martin) under the pseudonym, “Somerville and Ross”. Together they published a series of fourteen stories and novels, the most popular of which were The Real Charlotte, and The Experiences of an Irish R. M., published in 1899. The Irish R.M. was turned into a television series. 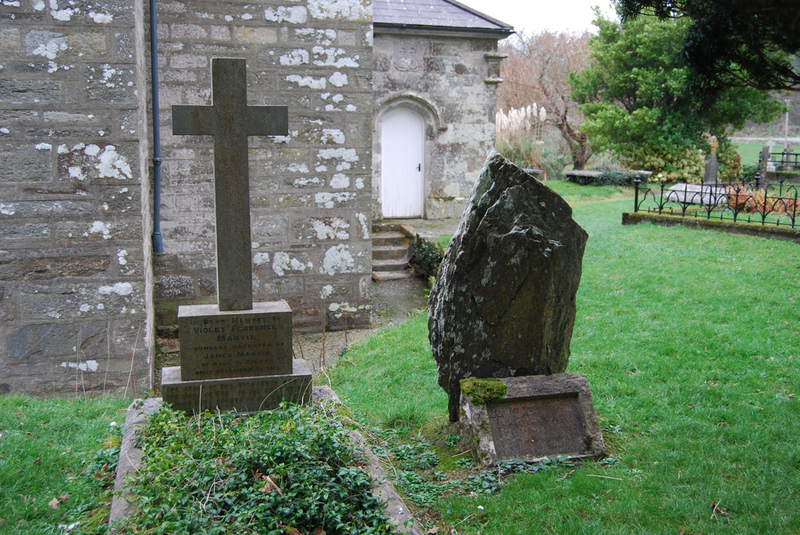 They are buried side by side in Castletownshend, behind St. Barrahane’s Church. In total these two ladies wrote over 40 books plus dozens of other writings/drawings between c. 1890 and c. 1930 – I have about 30 of them. Included in my archive is a copy of their 1968 biography written by Maurice Collins. The 3 pages attached are from this book – under a chapter relating to the Civil War (which was named ‘the Troubles)…the 6 pages give a flavour of what was occurring at the time in west Cork. However, on P. 214 you’ll note an interesting link between Edith Somerville and Michael Collins. Like many Gentry of that time some of the male Somerville’s served in the British army or navy and in the early 1920’s a number of Edith Somerville’s brothers were in the British navy – with one of them on one of the British war ships off the Cork coast in August 1922. Clearly ‘Pro-Treaty’ and describing the situation around Castle Townshend in August 1922 Edith Somerville’s diaries shows that she and her brother Cameron had a short meeting with Michael Collins in Skibbereen on the morning of 22nd August 1922 – the very day Michael Collins was ambushed/died. Clearly concerned about the way the ‘Republicans’ were raiding and destroying the properties of the gentry and fearing their property would be destroyed the diaries show they met with Michael Collins that morning – seeking additional state troopers for protection. The diaries state that while Michael Collins was sympathetic to their situation he told them he couldn’t help as he had no troops to spare. (hereunder are pages 210 to 215 from the chapter entitled the troubles). But though the Free State troops were able to take over a large part of the County Cork, they were not able to restore order at once. The Republicans made raids from the mountains. Houses continued to be burnt. Supplies were short. The roads were still unsafe. Martin’s protection remained essential. As their guardian saint, it seemed right that a special altar should be raised to hear in St. Barrahane church. This Edith saw to; she made an altar from a sideboard belonging to Glen Barrahane House and put it in the church. How the rector regarded this worship of St Martin is nowhere mentioned. But as we know Edith had a very practical side. ‘We have been making history in West Cork and have not finished yet,’ she tells Ethel Smyth in September 1922. ‘Skibbereen is now held by the Free Staters. Cameron and I are doing all we can to help them and act as go-between with the destroyer captains.’ The Republicans make sudden swoops down from the mountains. ‘They bring off their ambush and then bolt back to the hills. So it is not safe for us here.’ Drishane might be their next objective. However, a destroyer lies most nights in the haven, and a way of signalling to it in case of need has been arranged. But though the destroyer captains, under orders from brother Hugh, were ready to land a force and rescue them if necessary, their great reliance was on the ancestral ghosts. Yet sometimes they received wonderful succour from a terrestrial quarter. The story of Father Lamb is here much to the point. During July 1922 a small raiding party of Republicans had entered Castle Townshend and occupied the coastguard station. Seven of them remained and the rest withdrew. On 30 July twelve more arrived by motor. Their orders were to demolish the pier and wharves, as Free State troops were rumoured to be about to land there. To effect the demolition the Republicans forced local labour to help, standing guard over them with loaded rifles. It was at this point that a Roman Catholic priest, Father Lamb, intervened. His exploit is given in a letter written next day by Edith to Hildegarde. ‘A good deal of the end of the pier had been destroyed and was being thrown into the water when a boat was seen, coming at full speed. In it was the little R.C. curate, Father Lamb. As soon as he was within shouting distance he began to denounce the destroyers. Before the boat was alongside he leaped ashore, dashed up the slip and spring like a wild cat at the throat of the biggest of the armed guards. Father Lamb is a little fellow, aged about thirty, in height at most 5 ft 5 in; he looks less than ten stone but he is tremendously wiry and athletic. The man he attacked went down like a ninepin. He was a big lubberly boy of nineteen, and while Father Lamb tore at his rifle to get it from him, he lay on the ground, feebly protesting “No Father! No Father!” One of the guards rushed to the Castle grounds to summon their leader, Jim Z, another rushed to the coastguard station to bring up the rest of the gang. Father Lamb, transfigured by passion, with a dead white face and his very big light blue eyes blazing, ordered the pressed labourers to throw down their tools and go home at once. Then he caught the second in command, a burly young fellow, by the throat and dashed his head against the wall and, in the narrow lane leading to the street, he met Jim Z, the big captain (a huge young man) and his men, and stormed abuse and denunciation of the wickedness they were committing. Meanwhile the wretched workers, thankful for release, hurried away up the hill and gathered in a knot outside a public house. It was at this point that I arrived with Jem at the Two Trees. A crowd of village people were standing there and in highest excitement they told us that “the priest had stopped the work and was below on the quay talking to Jim Z”. In about three or four minutes we heard rifle shots from the coastguard station, and the sound of running feet, and then we saw about a dozen Republicans coming racing abreast along the Mall, one of them firing his rifle in the air every few yards. When they got to the corner and saw the group of workers they began to yell “Go back to your work”. The group fled down the hill again, the Republicans howling after them, running as fast as they could. I saw a little sickly boy of fifteen or sixteen (who had come to me to demand my pony and trap the night before, and hadn’t got it) racing and howling with them. They had got about halfway down the hill when I saw a little bareheaded black figure dash round the corner by the schoolhouse and charge up the hill into the teeth of the oncoming crowd. The fleeing workers checked their flight, separating, and leaving the priest fact to face with the Republican pursuers. He charged on, shouting, and to our incredulous amazement the twelve armed men turned as one, and bolted back up the hill. They fled into the public house, and the little priest bolted in after them like a terrier after rabbits. (I have since heard that he rushed upstairs and caught two of them in Mrs H’s bedroom and there and then smashed their rifles.) In what seemed less than a minute we saw him burst out of the house with a rifle in his hand. Big Jim Z had come up by this time. Father Lamb swung his fist round and with a jump caught him heavily over the side of the head. Jim Z made no return. The priest broke through the encircling people into the middle of the road. He tore the cartridges out of the magazine of the rifle and then catching it by the barrels. No one dared to go near him. This ended the fighting. Looting and arson continued in Castle Townshend until 300 Free State troops landed on 8 August. They were, however, insufficient to drive out the Republicans who had considerable forces in the neighbourhood. The British destroyer in the Haven could not be asked for aid. On 22 August Edith and Cameron went to Skibbereen on hearing that Michael Collins, the commander-in-chief of the Free State forces, had arrived there. They had an interview with him and found him sympathetic, but he had no troops to spare. Later that very day he was killed in an ambush. His death set back the restoration of law and order in the County Cork. The Republicans had it their own way for a while. Their bands continued to roam about pillaging and burning. Castle Townshend, however, was not entirely defenceless. The Free Staters who had landed, though too few to cope fully with the situation, were able to prevent the complete destruction of the place. Drishane, Glen Barehanded, and the other houses of the gentry were not burnt down. Nevertheless Edith and the rest had a frightening time as her letters to Ethel Smyth will now disclose. Uncle Kendal was very active when it came to fighting. After his exploit of frightening raiders by ghostly footsteps we find him credited on 29 September 1922 with laying a trap for them, which failed owing to Cameron’s negligence. 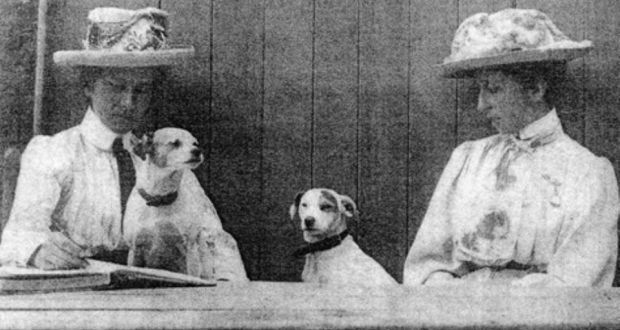 ‘We had a visit from raiders last night,’ Edith tells Ethel Smyth. Several men battered at the drawing-room window about 11 p.m. and shouted they had come to search the house for arms. Cameron, who was woken by the noise, went downstairs, opened a shutter and told them there were no arms in the house. He heard a man say ‘Fire a shot’ but no shot was fired and they seemed to go away. He hastened upstairs to Edith’s room and reported. It was decided to signal the destroyer, as it was hard to say what the raiders would do next. On its captain seeing a red light in Drishane, the agreed danger signal, he turned a searchlight on the house and ‘we knew that our signal had been recognised.